On 9 January 2019 Globethics.net received the Honorable Minister for Foreign Affairs of the government of Nigeria, Geoffrey Jideofor Kwusike Onyeama. Introduced by Dr Obiora Ike, Globethics.net Executive Director, Mr Onyeama made a short speech to the team, where he highlighted the importance of Globethics.net's work to embed ethics in the agenda of education not only in the curricula but also and more importantly in the values and guidelines used by institutions and government alike for better governance and better societies. He expressed the interest in governments supporting this kind of initiative and in pushing it to a more regional agenda. 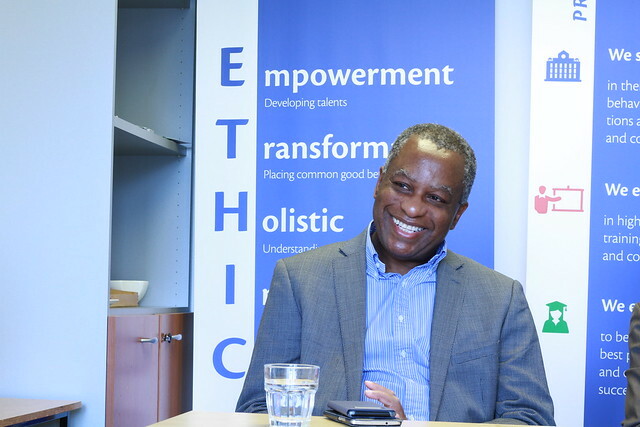 When visiting Globethics.net's Head Office in Geneva, Swizerland, located close to a number of United Nations agencies, in particular to the World Intellectual Property Organization (WIPO), Mr Onyeama remembered when he worked at WIPO. He explained the importance of ethics for this organisation and when they appointed an Ethics Officer to help the organisation to establish a code of ethics. Currently, WIPO's Ethics Officer has a key role in providing guidance to managers and staff, in addressing ethical dilemmas and, in dealing with conflict of interest questions. The Minister also engaged with Globethics.net staff in a discussion on morality and ethics and different approaches in Europe and Africa. Mr Geoffrey Onyeama, was appointed Minister for Foreign Affairs in the government of Nigeria in November 2015. Previously he has a Research Officer in the Nigerian Law Reform Commission Lagos; a lawyer with Mogboh and Associates in Enugu, Nigeria and then he joined the World Intellectual Property Organization (WIPO) as an Assistant Programme Officer for Development Cooperation and External Relations in the Bureau for Africa and Western Asia. He rose through the ranks at WIPO to become Deputy Director General for the Development Sector in 2009.